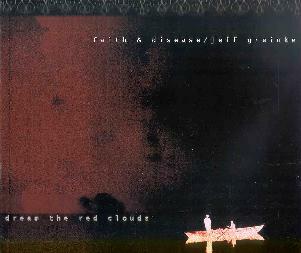 Faith & Disease / Jeff Greinke - "Dream The Red Clouds"
Dream The Red Clouds is a collaboration between ambient artist Jeff Greinke, known for his solo works as well as his Land and Hana projects, and Faith & Disease. I was previously unfamiliar with Faith & Disease, but they are apparently a Goth oriented band who have had releases on the Projekt label. Joining Greinke from F&D are Dara Rosenwasser on vocals and Eric Cooley on guitar and bass. Dream The Red Cloud is available as a 21 minute CD or 7" red vinyl, though the vinyl is limited to 300 copies. The music is characterized by gentle guitars and space ambient backdrops, some of which can get a bit trippy, over which Dara's dreamy folk styled vocals flow. The melodies are simple yet seductive and have a bubbling psychedelic quality that swept me away on its magic cloud. Though this is a brief set, 2 of the 4 tracks are in the 8 minute range so we get to hear the artists take the time needed to develop the music. Very nice. I'd be interested in hearing a full length from this trio. For more information you can email amplexus@tin.it. Distribution is through Sileilmoon at: http://www.soleilmoon.com/store/searchresults.lasso.